The winner is Atherton, a small town in Silicon Valley with just one zip code, with a median sale price (not asking price) of $4.95 million in 2017. But that’s down 8.8% from the even juicier $5.5 million in 2016. It beat Sagaponack’s 11962 zip code. The community in the Hamptons had reigned supreme in the prior two years. But in 2017, it dropped to 15th place “mainly due to more sales recorded at lower price points, which slashed its median sale price in half,” to just $2.82 million, according to Yardi’s PropertyShark. That’s quite a step down from $5.5 million last year. In second place is New York City’s 10013 zip code, which covers TriBeCa with its luxury condo developments. It came in with a median sales price of $4.1 million, up 7.7% from last year. In third place is 33109 in Fisher Island, “a small, secluded island community” in Miami-Dade County, with a median sales price of $4.05 million, which is up nearly 20% from 2016. By comparison, according to the National Association of Realtors, the median existing-home price in the US in October was $247,000, which includes all these high-priced areas as well. Median price means that half of the homes sold for more and half sold for less. The data is based on all residential transactions closed in 2017, including condo, co-ops, single-family, and two-family homes, according to PropertyShark. All package deals are excluded. The cheapest, so to speak, of the top 10 zip codes has a median sale prices of $3 million. Five of the top 10 are in California, four in New York, and one in Florida. San Francisco has nine zip codes in the top 110, the most of any city. But its most expensive zip code – 94118, with a median sale price of $1.9 million – ranks only in 42nd place. These types of averages can be a little confusing. 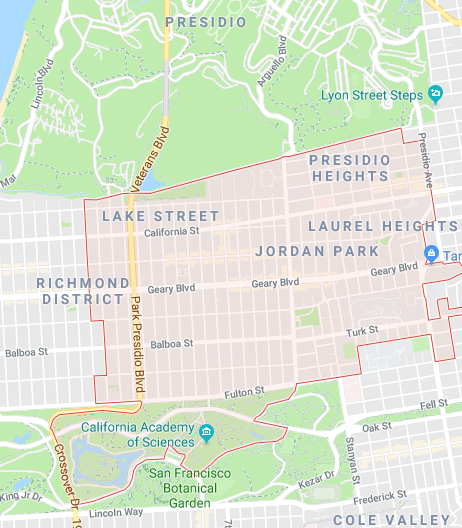 The zip code covers a large area with a mix of small ultra-expensive, movie-star-studded areas around Lake Street and Presidio Heights and much less expensive but larger areas, such as part of the Richmond District. New York City has seven zip codes in the top 110, two of which are ranked 2nd and 4th. The city of Los Angeles has five zip codes in the top 110, with the most expensive ranking in 19th place. Newport Beach (Orange County, CA) has four in the top 110, including one that occupies 12th place. At the county level, Los Angeles County is in the top spot, with 18 zip codes in the top. Santa Clara County, one half of Silicon Valley, is in second place with 15 zip codes in the top. San Mateo County, the other half of Silicon Valley, has 10 zip codes. The Related Group, one of the biggest condo developers in south FL, is expanding into Dallas with apt rentals. Looks like they hit saturation point in south FL. Now everybody is headed to Texas. I happily didn’t make your list. Apartments are at 100% occupancy in the Plano/Frisco area. 94118 is the Marina? I would have thought Russian Hill would be more expensive. I am pretty sure there are a number of 10 million dollar homes there. Heck even Zuckerberg has a place over there. Presidio Heights and Lake Street are super expensive. There are pockets on Russian Hill that are very expensive too. But again, zip codes are big, and 94109, which includes Russian Hill, also includes part of China Town and part of the Tenderloin, which is one of the edgier areas in SF. I didn’t know that Tenderloin is packed in together with Russian Hill :) That’s hilarious talking about the microcosm of America with the richest and poorest in the same zip code. I would think the average would still be higher when it comes to Russian Hill right? The Inner Richmond would pull the median higher because there’s nothing there that’s as bad as the Tenderloin, but I am guessing when it comes to extreme prices, Russian Hill takes the cake, so the average would be higher. I get data by neighborhood, and you’re right, it looks very different than data by zip code. I might post it next time I get it (early Jan). One of the few places in the world where an down an out alcoholic that sleeps in doorways is on a first name basis with a billionaire. Personally I do not understand why anyone would pay such good money to live in the fog. As with all speculative bubbles, buyers are conflating rising price with store of value. Shennigans, San Francisco is not even 2 square miles and Calabasas, in LA county with a median home price of 1.4M is 13 sq miles. Size matters, redo. SF is small, but not that small. It’s about 7 miles by 7 miles, so 49 square miles. Wouldn’t that be 49 square miles? I’m sooooo jealous!! Wolf has an edit function!!! Oh my could I use one of those. It feels small though. I walk from my place in the Outer Sunset to the Financial District 3 times a day for work. Took me 1.5 hours one way. Some people would consider that slow. i don’t give a lot of weight to these kinds of statistics. for example, i live in 10013 which is labeled as tribeca. my apartment doesn’t count because it’s a rental. the eastern part of 10013 is chinatown, where there is some serious poverty but again, it’s mostly rentals over there. chinatown is really resistant to gentrification. it’s very difficult if not impossible for non-chinese to rent there and i hope it stays that way. This is sad…. I respect your opinion, but sad. I refuse to beleive 02108 isn’t on here. I just checked the listings there the other day and didn’t find an asking orice below 7 million. Oh wait there it is at 81 … seems kinda low considering but I guess if it is all of Suffolk county then it will have much cheeper listings then I was looking at (for shock value). Ha, I love that, “I refuse to believe…” And you’re correct in your refusal. For some reason, the first zero dropped off the zip code. So when you searched for it, you couldn’t find it. Now I glued that zero back on, and it’s right there in 81st position, with a lofty median price of $1.475 million. The more people are willing to shell out the more we all have to pay. The trick is to find the highest ratio of a zip code with the highest income divided by the lowest housing cost. I believe you can find one in New Mexico. In Ca, the house might be, for many people, the biggest asset, the most important investment. house, doesn’t belong to you anymore. In Ca it might be the case for many old people. They just hang on, not able to move, or change. But you have prop 13, and you can take that with you to a new house (ie your current assessed value). I believe that you don’t have cap gains either if you buy a new home. Whatever happened to Woodside (zip code 94062) in San Mateo County? It ought to be right up there with Atherton. You can take your basis to another address within the same county or to a few other counties that allow transfers of basis providing the new place has about the same value or less as the old one. The capital gains rules were changed in 1997. My comment on expensive zip codes posted to the wrong article. GoogleEarth indicated the maximum altitude on Fisher Island is 9 feet. Not a long term investment scenario. To my knowledge one cannot even buy in River Oaks in Houston Texas because no one there wants to sell. I am surprised it is not on the list. I just checked. It occupies a small corner of a large zip code (77019). Prices are down and falling year on year in many of those zip codes. Still trying to figure out what’s so great about California. Traffic, smog, and taxes. But if you read People magazine or have a strong desire to strike it rich in tech, maybe California is your style. That’s our new marketing, we tell people things are bad here. We show scenes from The Grapes of Wrath where cops beat up the poor Oakies. The lines for everything are too long, the freeways too crowded. Try Phoenix, that’s our new tourist slogan. Hmmmm, One of the #68’s, Carmel by the Sea in Monterey County has been moved to New York. It has been moved back to California, where it will remain for the time being. It’s amazing how many places I’ve lived or live now, are on that list. I don’t know if I’m doing this poor thing wrong or doing it really right. Agreed. I too was wondering how places considered unsafe just a few years ago have made it to the list. I am not talking about places like Venice that used to be drug haven before the concerted effort by the local govt to clean up the place and make it trendy. I am talking about places like Duarte. 15 years ago, walking about the town was fraught with problems because you could wander into neighboring Monrovia and get mugged. AFAIK, you lived there because you either came into property or worked nearby at Trader Joe’s hq or a Seebeyond Corporation, or at the cancer center. Recently, I was driving through Hurricane and St George in NV. They are building homes all over these tiny towns. Not only that, they are building them in the middle of nowhere an hour outside st. George. I wondered how much of this is easy fed policy money at work and why anybody would buy them except to retire or use them for Airbnb for the nearby national parks. May be I should jump in and wait for the tide to make me a millionaire too. I used to shoot smallbore rifle matches in Duarte, and I remember some kind of argument or fight breaking out in a nearby soccer field, and everyone wanting to stay away from the soccer field because there might be shooting (not at targets lol) I’m not sure if the rifle range is there any more. Southern California used to have drag strips, circle tracks, horse-riding stables, all kinds of “let’s have fun going fast/getting dirty” things because they were out on the fringes of the towns. Now it’s becoming one continuous tilework of towns. Keep the kids safe at home, on their Playstation or if they’re rich kids, they might be able to sail or surf a bit. It would be interesting to look at the movement of the richest zip codes in the past 200-300 years,starting with Jamestown and Mt Vernon.To explore opportunities open to us in troubled times ahead. In the ’20s Detroit was richer than NYC.Now housing in Detroit is within reach of a minimum wage worker,even if he works part time. California’s Prop 13 helps to skew these number considerably. Not only is there a huge impact on the capital gains tax due to the increase in sales price, but the costs associated with the mortgage and property taxes are huge. Under Prop 13 the amount that the property can be taxed is based on the last sale price. If you sell your property with plans to purchase another in the State your tax burden is going to increase. For example: You bought a house in Burbank 20 years ago. At the time you took out a $200,000 mortgage on your $240,000 purchase. You now decide to sell. You are currently paying a property taxes based on that $240,000 with a maximum increase allowed of 3%. You sell you property for $1,200,000 and buy a new place for the same amount. (Not an easy thing to do…) Even if you put all the equity into the new purchase, you new tax bill will be based on a $1.2 million property. With the increase in the tax rate your monthly property taxes would exceed your previous mortgage payment. Prop 13’s maximum property tax increase is 2% per year. Yep. my fat fingered mistake. Still that just increases the disparity between an old vs. new purchase tax burden. @wolf, do good schools correspond to higher prices or are some of these driven by easy money? I wonder how many climbed into the list recently and are driven by ‘I have arrived’ phenomenon. Unlike school district driven places, the ones driven by money usually have a networking angle behind them. Something along the lines of meeting the Zuck when he comes out to throw trash and somehow hands over the keys to a business unit, etc. There is a relationship between schools and home prices. It could be in either direction: good schools improve home prices; or high home prices lead to better schools (more money). But I don’t think schools are responsible for a $2-million median home price. There are other factors at work to get that. One of the number 79s, 91008, is listed as Duarte. It really is Bradbury CA. Bradbury has no businesses or post office. Bradbury uses Duarte’s post office. Our Captains Courageous at the Fed see no bubbles. There are other zip codes missing to my surprise, both east and west coast. It is on the list: 94062 — “Redwood City” because it goes all the way into Redwood City. In 58th place. Newport Beach has 4 zip codes?